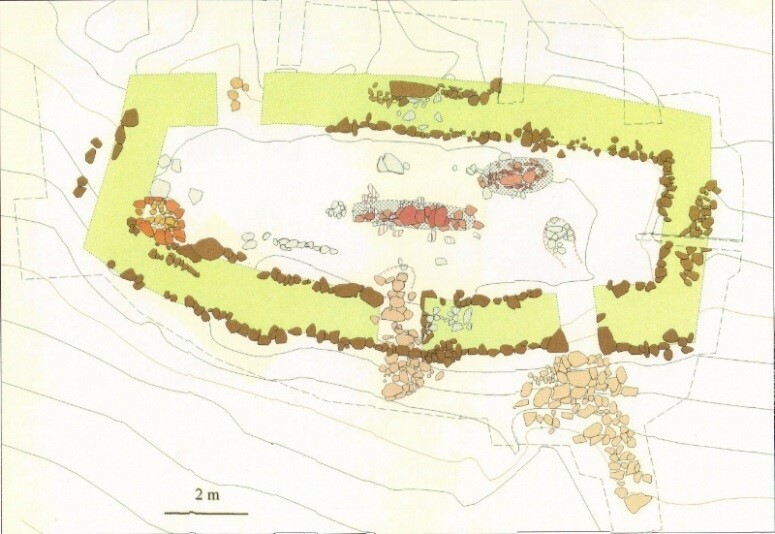 Archaeological research at Eiriksstadir in the mid-20th century and again in 1997-1999 revealed the site of a 10th-century Viking longhouse. This archaeological evidence finally placed the presence of Eirik and his family at a precise location in the valley. The archaeological site still remains visible to visitors. A reconstruction of the longhouse showcasing a typical Viking farmhome was built as a living museum and opened to the public in 2000. Excavations carried out from 1997 to 1999 show that a small hall stood on this site in the 10th century. The walls were made of turf and timber resting on a stone foundation. There northern side is straight, and seems to have been built up against remaining material from a landslide. The southern side is curved, as was customary in longhouse structures of this period. The entrance was originally in the middle of the southside facing the valley. It was later filled in, and another entryway was built closer to the eastern gable of the hall. Flat stones paved both entry areas on the exterior of the house. The older of the two fireplaces is closer to the northeastern corner of the hall. From the fact that two fireplaces and two entrances were found, it seems likely that the Eiríksstaðir longhouse was probably altered after the landslide hit the farm. The northern wall was rebuilt and moved about a meter (three feet) inside the original foundation of the house, which has resulted the ruin´s final layout being narrower than usual for a Viking Age hall. The hall seems to have been abandonned at the end of the 10th century which coincides with texts describing the family´s move out of the valley. During the 1998 excavations, this drawing was made showing the floorplan of the hall, the two fireplaces, and the entances revealed by the excavation.